Parents New to Autism: Don't Fall for Pseudoscience like DAN! or MAPS. This is an edited-for-privacy version of an article I posted on an autism parenting board this morning, in response to a parent asking for advice about DAN! doctors. One of the loveliest features of this group is the opportunity for parents who are new to the world of disability and autism is to hear from parents with many years of experience -- so those new parents can avoid some of the mistakes we veterans unwittingly made. DAN! (or MAPS, or "biomedical" approaches to autism, doesn't really matter) is pseudoscience. That means it is poppycock but sounds "sciencey," so that parents who are given few answers for how to help their autistic child by the mainstream medical establishment, and who are often desperate to "fix" their autistic child because of negative media messages about autism, will grasp at such seemingly authoritative straws. Hence the need for such practitioners to mention Ivy League credentials, etc., repeatedly. Note that DAN! doctors don't usually take insurance. So, erm, what are the families who can't afford such treatment supposed to do? Don't you think that if DAN! ideas were truly effective they would be embraced by the mainstream medical establishment and the government so that children of all income backgrounds could benefit, not just those whose families have sufficient income (or houses to mortgage)? Don't fall for it. Autistic kids need your understanding, not fixing. Yes, they need to learn how to cope with the world. But they also need to you help change the world, make it accommodate them, so they don't become so traumatized by it that they can't learn, or enjoy life. Does this practitioner or vendor promise miracles that no one else seems to achieve? Is the person promising the outcome also asking me for money? Do I find any scientific research supporting their claims, or are there only individual (often emotional) testimonials of effects? Does the practitioner or vendor promise a blanket “cure” for unrelated disorders, such as grouping together allergies and autism; or autism and ADHD; or autism, diabetes, cancer, and allergies? Does the practitioner or vendor have strong credentials as an expert in the therapies they’re promising, or in the field of autism? Thinking critically is one of the most important actions we can take for those we love, and for ourselves. Good luck. You are not alone. So don't fall for anyone who tries to isolate you and turn you against the mainstream medical establishment -- while gladly taking your money. One of the highlights of the 2015 International Meeting for Autism Research (IMFAR), for me, was being invited to speak on the panel for the ASDtech SIG (Special Interest Group). I've created a Storify compilation of the panel's highlights, but was also given the chance to opine on how tech can best benefit autistic people like (and unlike) my son. So I did, as you might imagine. Sue Fletcher-Watson of Edinburgh University organized the panel and moderated the discussion. My co-panelists were Ofer Golan of Bar-Ilan University and The Transporters; Dan Smith, President of Autism Speaks's DELSIA, (Delivering Scientific Innovation for Autism); and Oliver Wendt of Purdue University and SPEAK MODalities LLC. I’m senior editor at Thinking Person’s Guide to Autism, which is a website, book, and information-sharing community of autistic people, professionals, and parents. I’m also the parent of a 14 year old mostly non-speaking son. He’s very awesome. If you’re interested in iPad technology you might know him, he was in a lot of the early videos [at 13:45] and articles about iPads and autism. My background is as a software producer, professionally, for both Electronic Arts and The Learning Company. I’ve been using that expertise to give iPad workshops all over the world about how iPads can benefit autistic people, and I help maintain a recommended apps and resources spreadsheet that has been shared a lot. But one of the most important things I try to do as part of Thinking Person’s Guide to Autism is, in our Facebook community — which has over 130,000 people and I highly recommend you join — is hear directly from families, from professionals, and specifically from autistic people themselves as to what is it that they want in their lives, what will help them. So if you’re talking about dissemination, and making connections: we have a fairly global audience, and community. And that is a really good way to actually build those vectors. What we mainly hear from our autistic community members is that they need things to help them now. 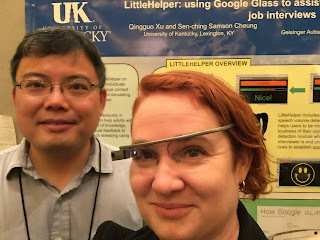 I don’t know how many of you are familiar with the wearable technologies research of Matthew Goodwin, or of W. Samson Cheung at the University of Kentucky and his LittleHelper software for Google Glass — but these are technologies that are going in the right direction, which is that they have the potential to help autistic people be better autistic people, instead of trying to normalize them. It’s really important for autistic people to learn to cope with a world that is generally not set up for them, and not friendly to them — but we should not be doing that by trying to force them to be non-autistic. We should be helping them learn, and cope, and adapt. So you can look at Mr. Cheung’s Google Glass and realize that its ability to help people identify others’ facial expressions and moderate voice volume are actually things that could potentially help some autistic people in situations like job interviews. These are things that can help with social function and adaptation -- in ways that benefit autistic people themselves, and not just the people they're socializing with. from the University of Kentucky. And I talked with Mr. Cheung about the idea of not forcing eye contact, about learning to look at eyebrows or noses instead — because as you may or may not know, for many autistic people eye contact is painful. It’s an aversive. And they can either give you eye contact, or they can function, but they can’t do both. What I also see is more autistic people wanting help with sensory issues and being overwhelmed by sensory stimuli, because for so many people, just being in this room — with the bright lights, and the echoey amplified sound, and the crowd — could use up all the spoons they had for the day (if you’re familiar with that analogy). I don’t know if you’re familiar with the work of Phoebe Caldwell, who is a UK sensory issue experts. But she is an advocate of simple tech making huge differences, such as the kind of noise-canceling headphones that helicopters pilots wear, which screen out background noise yet still allow for conversation — again, just for functioning, because for many autistic people sensory issues are actually a huge impediment to learning, and if you don’t actually screen for sensory issues using low tech, in many cases, then autistic people are going to be disabled not because of their autism but because of the environment that they’re in. Personally, I’d like to see more work on tech for communication, and communication apps. And not just to encourage speaking, but in terms of easier ways to evaluate the communication potential of autistic people. To use my teenage son as an example: He has lots of great scripts,as well as some spontaneous words. So we were told — for years! and by one of the best speech pathologists in our area! — that he didn’t need AAC [augmentative and alternative communication options] because he could speak. And now we know that that’s actually not true, that a lot of autistic people have apraxia, processing issues, and motor issues, which means they can actually communicate better through non-speaking means. But the people who have some words, or can talk, are often overlooked. I’d like to see more available apps, not just in terms of the kind of learning and adaptive tech some people on this panel and in this room are doing, but in terms of making *screenings* more available. I’d also like to see more recognition that speaking is not the most efficient means of communication for many autistic people. Help, don’t try to normalize autistic people. Keep the humanity of autistic people in the front of your mind at all times. They are people, not projects. Implement good design -- there is so much good tech content stymied by bad design!. This can also ease localization into other languages and cultures. In many countries and regions (e.g. Accra, Ghana) there is often no or little wifi, or even available devices. Tech has to work under those conditions. **Side note: I have asked after useful but assumption-free approaches to describing people of different races and appearances for screen readers. Some people prefer purely objective descriptions, e.g., would describe me as having light beige skin and Mr. Cheung as having dark beige skin -- and leave it at that. Other folks feel it's unhelpful to leave out race. I have not yet come across a fully persuasive argument either way, and am interested in hearing opinions on this matter.